Dutch designers Waarmakers have created sustainable rubbish sacks for discarding unwanted items in good condition, in the hope that they'll be picked up by a new owner instead of ending up at a landfill site. Once full, the bags with transparent panels are left in the street along with normal refuse so passers-by can pick them up and make use of their contents. The items are kept clean and dry but still visible, and if they remain in place when the refuse collection truck passes then they will be taken away with the rest of the rubbish. The project aims to introduce a more sustainable method of waste disposal along with a benevolent attitude towards providing potentially useful items for others. "We started out by trying to make a product that would require the least bit of effort for all involved, so lowering the threshold to act altruistically for the user as much as possible by making it the same act as taking out the trash," Simon Akkaya of Waarmakers told Dezeen. The word goedzak means "do-gooder" in the Netherlands, and also combines the Dutch words for "good" and "bag". The designers plan to collaborate with a chain of second-hand shops in Amsterdam called Kringloop Het Goed whereby the bags are picked up and taken to their stores, and the items are sorted and resold or recycled from there. Waarmakers comprises Maarten Heijltjes and Simon Akkaya, two graduates of TUDelft in the Netherlands. The Goedzak idea was part of Akkaya's graduation project entitled Design for Altruism, which aimed to "design products that stimulate people to act to benefit others, preferably complete strangers." Goedzak is a special garbage bag for items that are still useable. It’s a friendly way to offer products a second chance and stimulate sustainable behavior. Whether it’s that purple vase your sister-in-law got you, or that particular coffee-pad-loving coffeemachine (you know the one) that’s been lying in the basement for ages; everybody owns items that are no longer of value to them. Every now and then we throw out these items, while they still might be of value and/or useful to others. These items disappear in grey garbage bags and end up on trash piles. Goedzak offers these items a second chance. 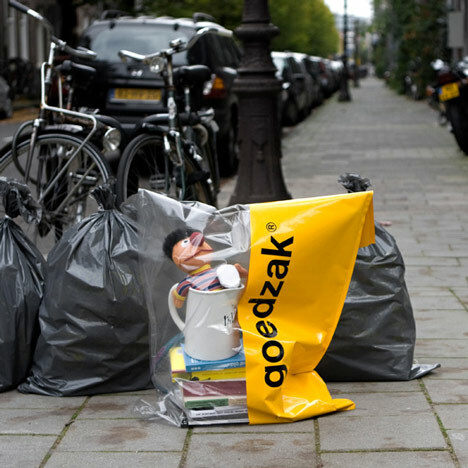 Goedzak stimulates people to dispose of their products in a more conscious and sustainable way. Goedzak can extend the products’ lifetime.